My last book was a book that my five year old likes to “read” to me, so I decided to make my next book one that she actually will try to read. I think this book is a great choice for a reluctant reader, because it builds confidence while also be a lot of fun. 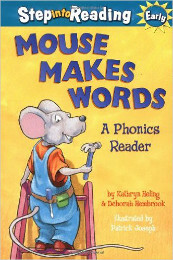 The premise of the book is that a mouse is building words. The mouse does this by changing one word into a rhyming one by changing the first letter. It is really well done, including a couple of choices that the kid can’t just guess, but actually has to read. It is one of my “go to” read together books when my five year old is actually in the mood to try to read something herself. All content copyright M.R. Nelson, 2015. All rights reserved.